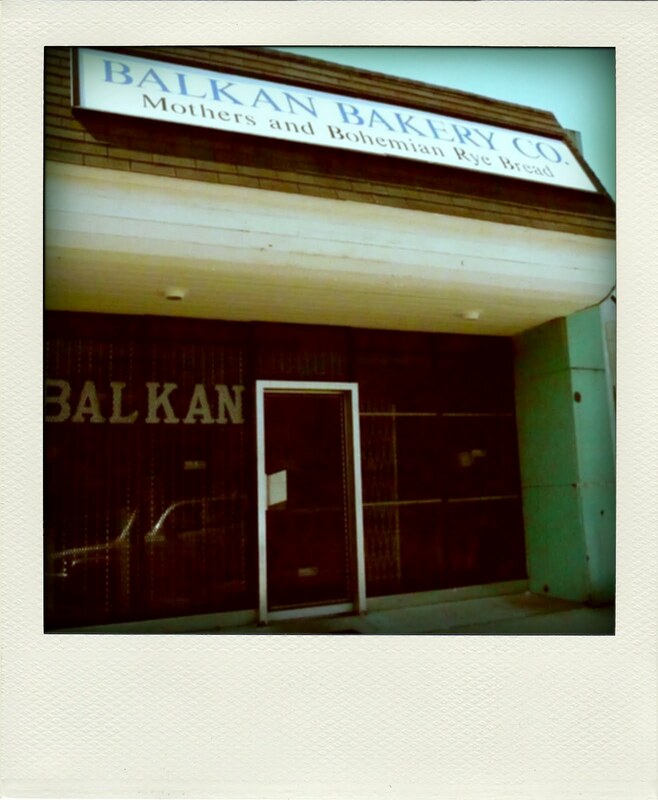 For more Flint Expats posts and comments on Balkan Bakery go here and here. What is "Mothers Bread" ? Awesome east European bread. Simply the best. Mother's is the signature, uncut loaf of bread at Balkan Bakery. Great toasted. With butter. The bread is great, the other baked goods not so much. My question is how have they survived in that location across from Civic Park? I used to go there almost every Sunday for Bread. They were on St. John Street, the big guy in there usually gave me a few Cookies or a Cream Stick. This was over 60 years ago. > My question is how have they survived in that location across from Civic Park? My guess is, they own it, so their operating costs at that location are low, but their cost to move somewhere else would be high because of the equipment moving and the downtime. Also, I think it's been the case for decades that the storefront retail business they do is minor, compared to their primary revenue streams from specialty bread sales in supermarket deli areas and from supplying bread to restaurants. They probably concluded a long time ago that their retail business wouldn't be much different at any location that wouldn't cost them vastly more real-estate-wise. Certainly they could move to a strip mall in Grand Blanc and have 10x the retail sales, but they might also have 20x the operating costs. I'm wondering how they've survived that Atkins diet trend... alot of NYC bread places didn't. New York is a lot trendier than Flint. I knew plenty of people that thought Atkins was a stupid idea. If my memory serves me right -- the Balkan bakery wasn't always located across from Civic Park. They use to be located in the St. John Street/Stewart area before the expressway was built. > I'm wondering how they've survived that Atkins diet trend... alot of NYC bread places didn't. Man, my family was buying bread at this location starting in about 1971, I think. Had no idea it was the second location. My memories of good food aren’t limited to just restaurants – because if you’re lucky – the best food that you’ll ever eat will always be at home. When it comes to good food – Sunday dinners should be in a category all by itself. My Mom and her second husband, Steve Rosa, really did Sunday dinners proud and it was usually centered around chicken. Most of the time it was fried chicken and other times it was Hungarian chicken and rice – and if you know the Rosa family – they never made just a “little bit of red rice” – they made enough rice to last for days. My Mom and Steve’s fried chicken is another one of those items that I have never been able to find anywhere or see duplicated anywhere. The both of them made the chicken and it was a team effort all of the way – from cutting up the chicken, skinning the chicken, dipping it in egg and then rolling it in bread crumbs before they placed it into a pan of hot bubbling Mazola oil to cook. I think part of the good flavor of the chicken came from the pan – they always used this one oval shaped pan and the bread crumbs weren’t just any bread crumbs – it was dry bread crumbs that they made and seasoned themselves from loaves of dried Mother’s Bread from the Balkan Bakery. There was something about my Mom and step-father’s fried chicken. I love to eat the skin on fried chicken – but you didn’t miss the skin not being on my parents’ fried chicken – you just enjoyed it! One of the things I'm not is a developer of high end residential areas. If I were, though, I'd want to do a project that had a little shopping area at its entrance...just a few businesses, but really good ones. There'd have to be a good deli/fruit and vegetable/grocery/meat store, something like Papa Joe's in Birmingham; and a pizza joint/bar; and of course a bakery, which would have to be Balkan Bakery. When I was a kid, the white bread (currently called "Mother's") had a light glaze, which made it somewhat golden and also (I think) added a bit of crispness to the crust. It also had a little cornmeal on the bottom. Now, of course, those are gone. The crust also is a bit thicker now, I think. It's still very good, but I preferred the old way. Anybody know when those changes occurred? I remember getting loaves of Balkan Bread (we never called it Mothers) from St. Johns St, and later, much more often from the Civic Park location. St Michael's Byzantine church used to be on the corner of Fleming and Pierson and we'd stop on the way home and pick up several loaves, still warm from the oven. I'll forever associate the taste of Balkan Bread with margarine with breakfasts after church at my my Grandmothers. Balkan Bread slathered in butter with a mug of hot chocolate after cold winter's day of building snow forts brings back childhood memories. Anyone remember having trouble getting the buckles of their galoshes undone because they were encased in ice? I've made lots of home made bread, but have been unable to duplicate the crisp crust and soft interior. It's been over a decade since I've had any. I miss it. I remember piling into my dad's 1952 chevy (which we had till 1960) on Sunday mornings, and driving across town to the Balkan bakery. It was located on ST. John street at that time. My dad would time it so that he picked up loaves of "hard crust" bread that were still quite warm-just out of the oven.Then a quick trip home (near Longfellow JHS), slice it up and watch the butter melt right into it. Nothing like it. I also remember huge sugar and molasses cookies from there as it was a full bakery then. I miss Mother's Bread. Live a couple hours north of Flint now. Great treat when it was warm and spread butter (real butter) on it. We always called it Mothers Bread. Check out the sign. My dad used to buy up several loaves of Mother's bread at a time, too. (Was a firefighter's favorite!) All these years later...and many miles north... I've finally mastered making a load that rivals what we used to buy at the Balkan Bakery. Sadly, Dad is no longer here to share it with. are they closed or on vacation ? Glazed donuts purchased before school on cold snowy mornings. The donuts were still warm and the glaze not yet set. I remember leaning up against the outside wall of the bakery, feeling the heat from the ovens through the cider block walls. Oh, so good!